The elections are finished in Israel as of 10pm last night. A total of 67.9% of eligible Israeli voters voted yesterday. This is a 4% lower voter turnout than in the 2015 elections, but still about 20% higher than American congressional elections turnout and about 8% higher than American presidential elections. I asked a number of people whether or not they would vote in these elections and found that most of the people who didn’t vote chose not to vote because they believed that none of the parties represented their primary concerns. Nonetheless, Israel’s voter turnout is admirable and truly helps Israel to continue in a direction that is representative of the wishes of a majority of the population. Now, the majority parties will seek to build a ‏“coalition”. There are two parties working to build a coalition: Blue-White with 35 seats and Likud with 35 seats in the the Knesset (the Israeli parliament). Whichever majority party succeeds in building a coalition will be the party whose party leader will serve as prime minister of Israel. 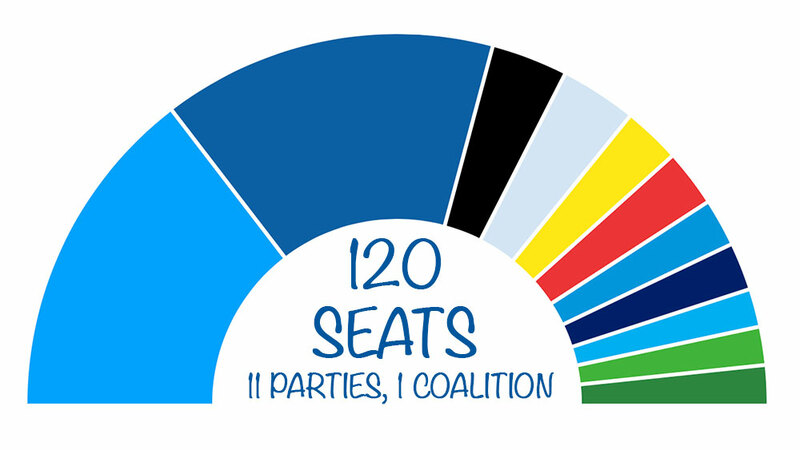 Of the 120 seats in the parliament, the majority party must reach agreements with enough members of other parties so that at least 61 seats of the parliament participate in the coalition. As it stands, the Likud has the potential to reach an agreement with the remaining right-leaning parties in the Knesset which would lead to a coalition of 65 seats (4 more than the required 61). However, there is some speculation as to whether or not the Likud can secure the support of the Yisrael Beiteinu (Israel our home) party, led by former Minister of Defense, Avigdor Lieberman. If the Likud fails to secure the support of Yisrael Beiteinu, they will fail to form a coalition without the support of the Blue-White Party. However, the precondition for Blue-White forming a coalition is that they have Benny Gantz as the prime minister, which Likud is especially resistant to accepting. At this point in time, Netanyahu has already been prime minister for the longest continuous period of time (10 years and counting). The prime minister who served the second longest continuous amount of time was Israel’s 1st prime minister who served for almost 9 years during his first term of service. While a majority of Israelis have indicated in the polls that they feel it is time for Netanyahu to move on and for a new prime minister to take his place, a majority of Israelis have also indicated that they feel Netanyahu is the only truly qualified candidate for the position of Prime Minister. Even if the Likud succeeds in forming a coalition now, numerous parties have expressed that they would require Netanyahu to resign, if he is found guilty of the charges brought against him. In that case, a new coalition would have to form. Of course, the question remains, were Netanyahu to be replaced, could his replacement arise to the occasion and truly represent the interests of Israel today? Only time will tell.